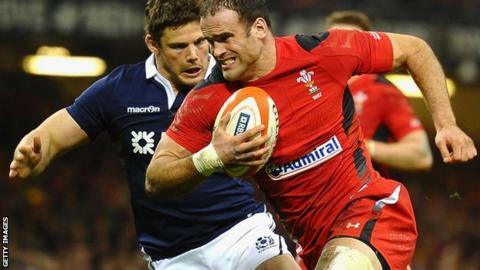 Signing Wales and Lions centre Jamie Roberts would be a "big statement" by Harlequins, the club's director of rugby Conor O'Shea says. Quins have had advanced discussions with the player, who is set to leave Racing Metro at the end of the season. There is also interest from his former region Cardiff Blues, who have made an offer to tempt him back to Wales. "If we could get someone of Jamie's ability it would be a big statement of what we are about," O'Shea said. Speaking to BBC Radio 5 live, he added: "But that's his decision, not mine, and we will respect whatever he does." Quins announced the signing of Samoa centre Winston Stanley from the Highlanders on Thursday, while experienced internationals James Horwill, Adam Jones and Tim Visser will also move to the Stoop next season. O'Shea says Roberts, 28, would be another significant asset if they can add him to the squad. "We would love to have someone of his ability, mentally and physically," O'Shea said. "We've got Adam Jones coming in to support people like Will Collier, Kyle Sinckler and Matt Shields. We've got James Horwill coming in supporting George Merrick, Charlie Matthews and Sam Twomey. "We want players of that ability. It's his decision, and I know it's a big decision for Jamie." When contacted by BBC Sport, Racing Metro did not comment.